The minute you step off the ferry and walk up the short flight of steps on to Isola Madre, you’ll sense the island’s great serenity. You will find no tourist stalls or hawkers here. Instead, the waft of floral fragrances surround you and the quiet is punctuated by an occasional screech from one of the many peacocks, pheasants, and parrots, which have free range in the extensive gardens. From here, the view of the Alps and lakeside towns is extraordinary. This island is the largest of the three islands in the southern half of Lake Maggiore. 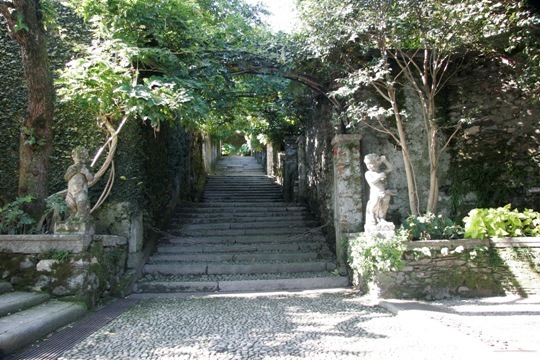 Close to the delightful town of Stresa, it has been owned for over 500 years by the Borromeo family, whose descendants still take up residence there part of each year. Public access to all but a small part of the island is available for a modest entrance fee (currently Є9.00), which includes entrance to a large part of the 16th-century palace, the family chapel, and all of the surrounding gardens. There is a small restaurant at one end of the island. Within the walls of the palace and among the opulent corridors and rooms are three large areas, which were set aside for puppet shows to not only entertain the children in the previous three centuries, but adults of the family and their guests as well. Every imaginable stage backdrop is there — from Greek mythology to the pyramids of Egypt. Hundreds of marionettes with interchangeable arm and leg positions, multicolored costumes in satins, lace, and velvets adorn the walls in glass cabinets. Outside, the grounds offer a true feast for the senses. Five centuries ago, they were planted with eight hectares of orchard. But when Count Lancellotto Borromeo obtained the island in perpetual lease from the Curia of Novara in 1501, he began its transformation into the carefully manicured gardens you see today. Bright blossoms of crimson, yellow, orange, and lilac abound as do rare plant species originating from around the globe. This garden is world famous for its variety of exotic plants as well as its extensive collection of azalea, rhododendron, camellia, and bougainvillea. As you stroll along the tiered walkways, you will find several secluded areas where you can stop to sit and rest and enjoy the sights and sounds. The very reasonably priced public ferries to the Borromeo Islands leave from the main pier at Stresa every 30 minutes. (There are privately owned taxi boats as well, operating in the same vicinity, but they are more expensive.) The public ferries operate to a published timetable and also service some of the interesting small lake side towns. If you wish, you can see all three islands for the price of a single ticket (currently Є10.00) and spend the day island hopping. However, if you would like to get away from the shoppers and hawkers, Isola Madre should be your destination — a heavenly, blossom-filled respite at the foot of the Alps.